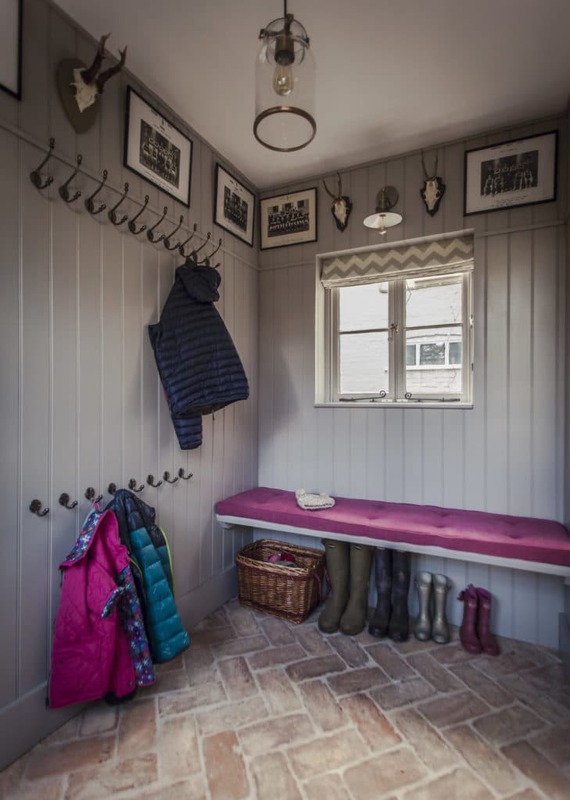 Whether you call it a boot room, a mudroom or a cloakroom – it’s usually the first room your family and visitors enter when they come into your home. This not only means a great first impression is important, but it has to be practical and hard wearing too – especially with the English weather where mud and dirt often find itself inside the house. Having a space either at your front door or back door where discarded boots, shoes and coats can stay without having to walk through the house can help keep your home clean. Typically a boot room will have a tile or brick floor. 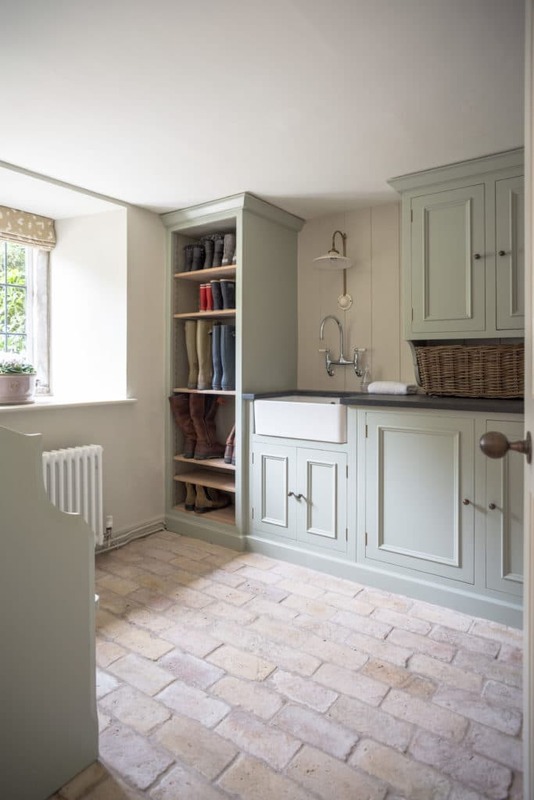 As you can see below our reclaimed brick tiles are often used in such rooms because they’re hard-wearing, easy to clean and they just look great in a country house (if we don’t mind saying so ourselves!). The great part about our reclaimed brick floor is that it only looks better with age. Once sealed correctly you have a floor that is easy to clean and can stand up to a lot of foot traffic. 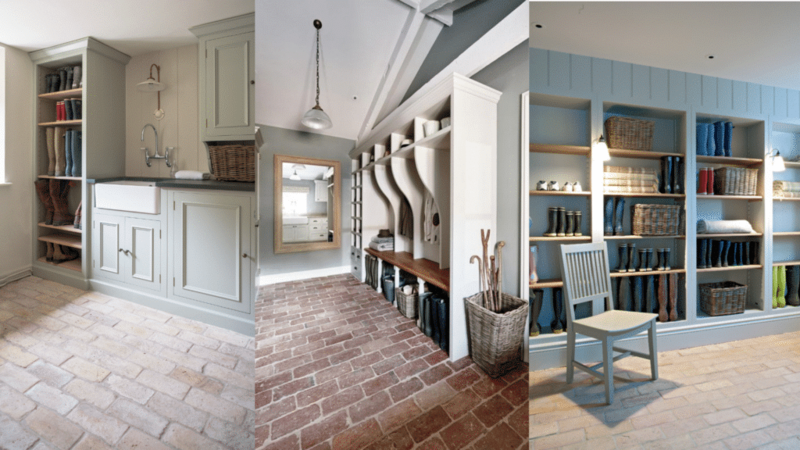 To see our range of brick and terracotta floor tiles, feel free to peruse our range here! 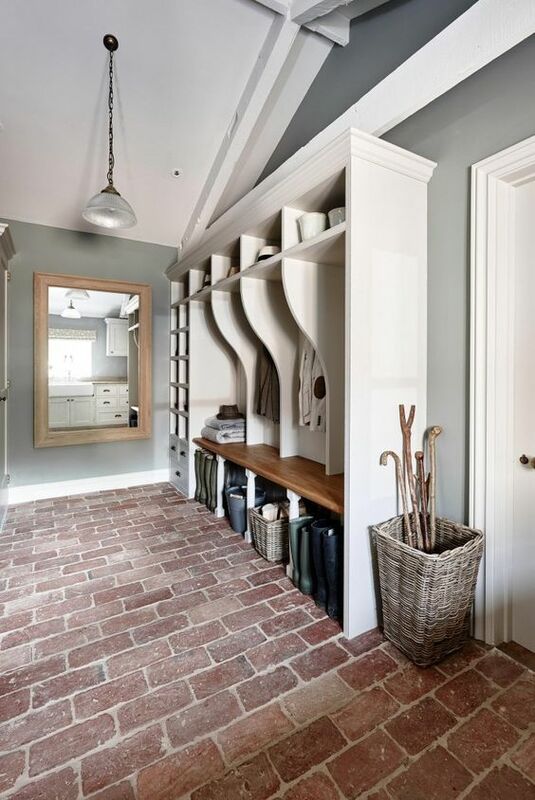 An elegant country style boot room with a stretcher bond floor pattern. A large wall of built-in cupboards keeps everything tidy but still in easy reach. This is more of a utility room but was close to the front entrance. This room also has a stretcher bond floor pattern, storage space and a large sink for cleaning boots. 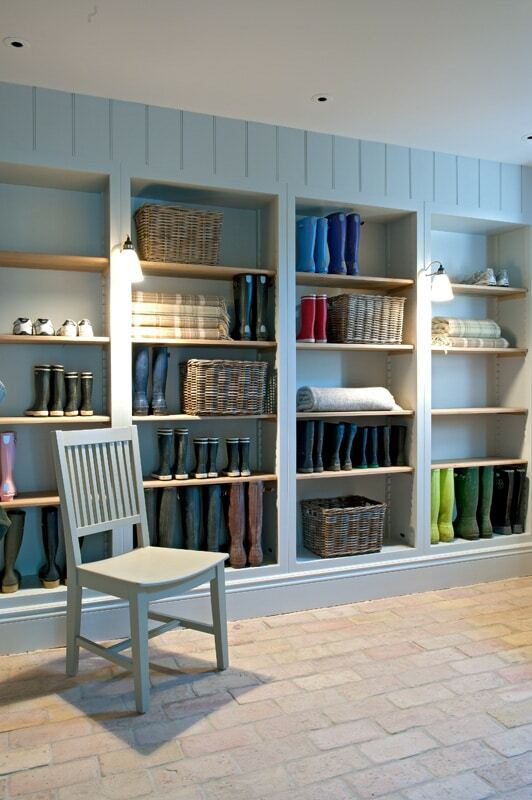 This is one of our favourite boot rooms with our reclaimed brick floor. This has a herringbone pattern with a washed finish. A smaller space, but still enough room for storage including boots, umbrellas and coats. We love the attention to detail here and how well the colours go together. Here you can see our warm brick tile in a 45-degree herringbone pattern. The brick floor really works well against the grey paint. Again this floor is extremely hard wearing and offers a lot of character to your space. 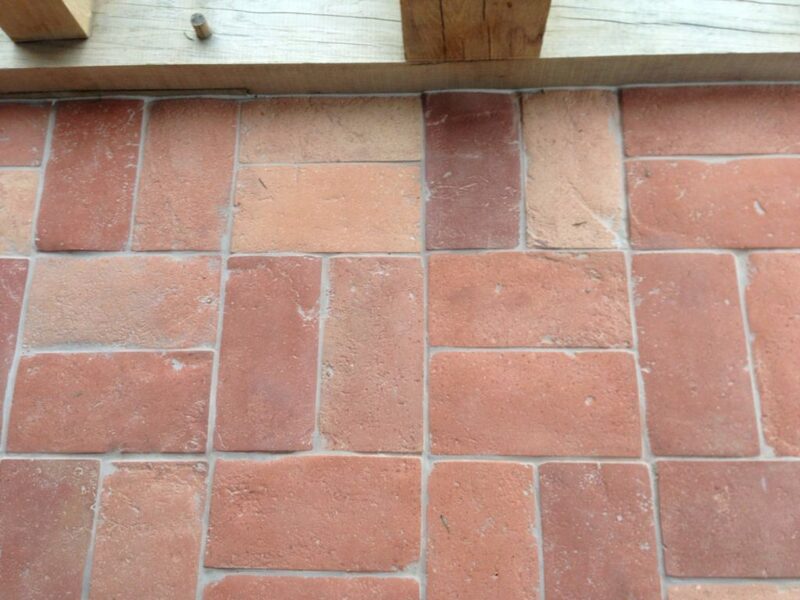 This is a large reclaimed terracotta tile used at the entrance of a garden. Any marks can be easily cleaned out and once sealed correctly last a lifetime. If you are interested in some more design ideas for your house – feel free to check out our other projects here.